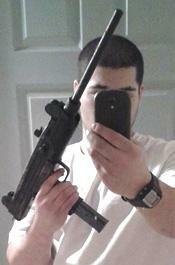 MARCH 10--A Michigan bank robbery suspect was collared by the FBI after posting a Facebook selfie showing him holding a submachine gun that he allegedly brandished during a holdup last week. Investigators allege that Jules Bahler, 21, robbed three Michigan banks over an eight-day period ending last Wednesday. During the first two heists--at banks in Pontiac--Bahler passed a note to a teller and demanded money. 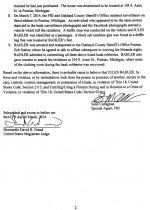 On March 5, Bahler walked into a Chemical Bank branch in Bay City and “displayed what appeared to be a black sub machine gun and demanded money,” according to an affidavit sworn by FBI Agent Sean Callaghan. After a teller gave Bahler $7000, he fled the bank. 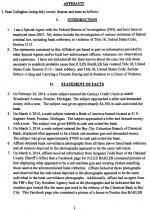 The prior Pontiac robberies, Callaghan noted, netted Bahler a combined $8300. 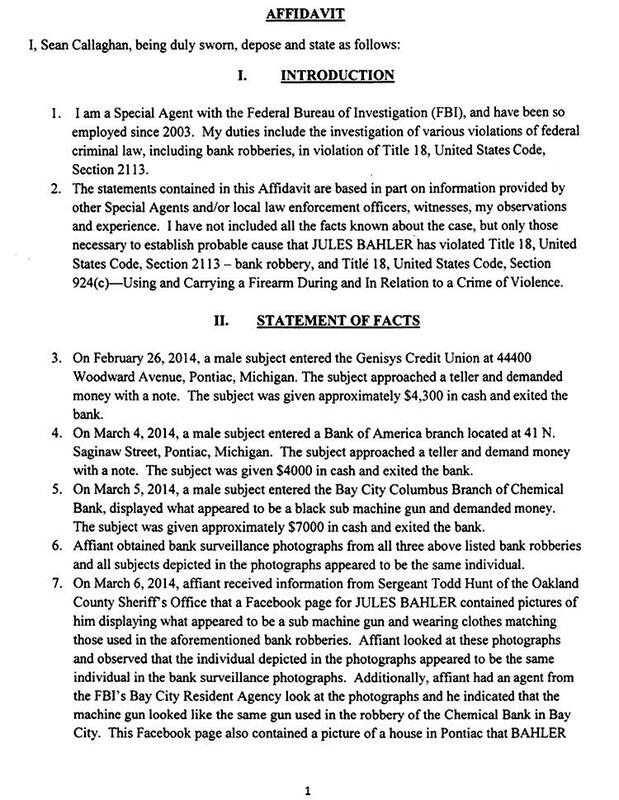 A police sergeant Thursday pointed the FBI to Bahler’s Facebook page, which included photos of him posing with “what appeared to be a sub machine gun and wearing clothes matching those used in the aforementioned bank robberies,” reported Callaghan. 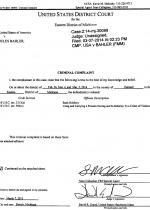 The affidavit does not reveal how the cop identified Bahler as a possible suspect. 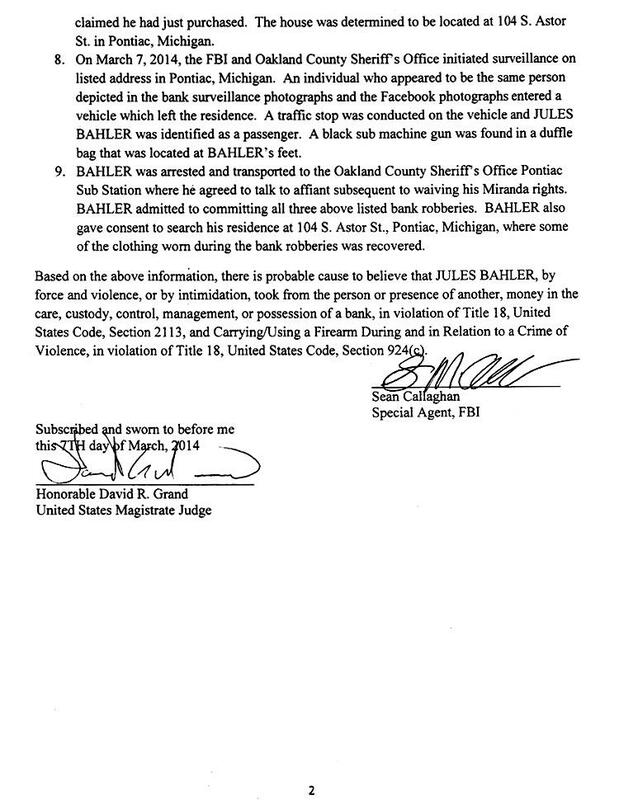 On Friday, investigators conducted a traffic stop on Bahler after they watched him depart his Pontiac home. 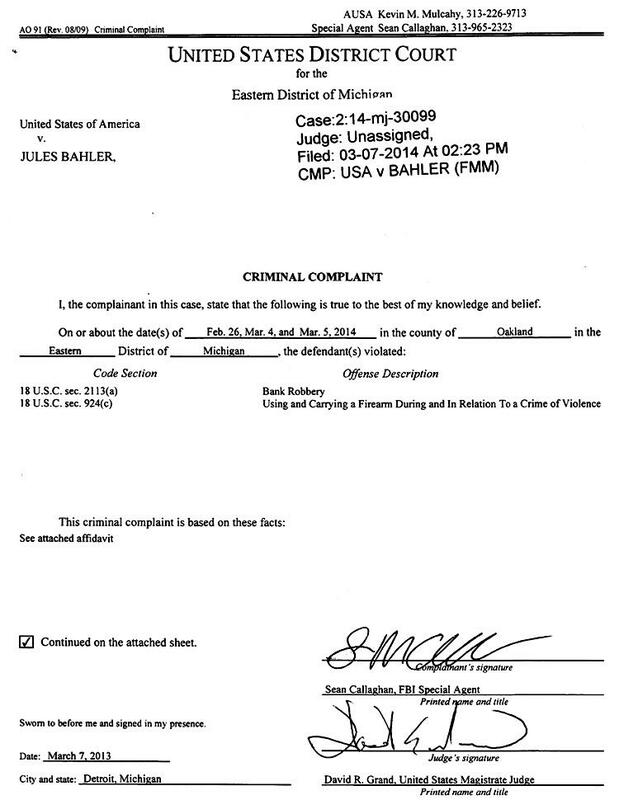 “A black sub machine gun was found in a duffle bag that was located at Bahler’s feet," Agent Callaghan reported. During a subsequent interview, Bahler waived his Miranda rights and reportedly confessed to all three bank robberies. Bahler (seen at left) was named in a two-count felony complaint charging him with bank robbery and carrying a firearm during the commission of a violent crime. He is locked up in advance of a detention hearing scheduled for tomorrow afternoon in U.S. District Court in Detroit.